NASHVILLE, Tenn. (September 10, 2015) - Internationally acclaimed singer/songwriter and classically trained violinist Jean Watson has been hard at work in the studio prepping the release of her seventh full-length project, Steady My Gaze. The project, which is set to impact retail on Friday, October 9, 2015, will be released on the Shadowlands Music label and distributed to retail by New Day Distribution. Steady My Gaze features an abundance of Celtic-infused violin, Watson's signature haunting vocals, along with the special treat of stellar fret-work from master guitarist, Phil Keaggy and guest vocals from Tree63's John Ellis. "I chose Steady My Gaze for the title of my new CD because it reflects my desire to keep my heart focused on the Lord, no matter what is going on," Watson explains. "The songs on this project express my love for God through passionate words and music! The arrangements are energetic and fresh, and Phil Keaggy's guitar playing is simply amazing. Having John Ellis of Tree63 sing on one of the songs was such an honor, and Billy Smiley did an amazing job as producer. I hope this new music is as encouraging and fun to listen to as it was for me to make!" Listeners are immediately greeted by the album's opener, the joyful, exuberant pop confessional, "Overcome," as Watson's fetching vocals are embellished by understated beckoning drums and meandering electronic keys. The joy continues with the driving rhythms and uplifting message of "Together Now," which features Watson and Tree63's John Ellis playing tag-team on the lead vocals. The high energy subsides for the more subdued yet equally passionate, acoustic ballad, "Impossibly Beautiful." The gentle, bluegrass-tinged title track gives Watson room to expand her emotion-laden vocals as she encourages listeners to allow Christ the freedom to live, move, breathe and come alive in their lives. "Steady My Gaze" segues effortlessly into the sweetly evocative piano ballad, "Speeding Train," which also features Keaggy's lush guitar. Watson downshifts to the haunting, introspective, yet encouraging, "I'll Find You There." Watson's innate energy once again explodes with tightly-focused control on the rocking "Burning Desire." She continues to channel that control on the gently driving "Against Your Love." The music takes a delightful, unexpected turn as Watson wraps her signature vocals around the beloved classic hymn, "Be Thou My Vision." She imbues the song with rich textures and embellishments, making it truly her own. Joy takes center stage on Watson's updated, up-tempo version of "Lord of the Dance," but it is peace that settles over the project's concluding contemporary hymn, "Trust His Hands." She closes the project with a lovely, worship-filled acoustic version of "Overcome" that features her own pristine violin and acoustic guitar from Keaggy. Watson shared songs from Steady My Gaze as the musical guest for Christian Retailing's Best Awards during the recent International Christian Retail Show (ICRS) in Orlando, Florida, eliciting an outpouring of accolades from fans and industry insiders alike. "When Jean was performing/worshipping, I felt a very strong sense of the Holy Spirit," noted Christian Retailing's editor, Christine Johnson. "I was so glad we were able to have such a significant talent and worshipful artist play and sing so beautifully at this year's Christian Retailing's Best awards." For more information about Watson and Steady My Gaze, visit jeanwatson.com. Internationally acclaimed singer/songwriter and classically trained violinist Jean Watson began her career as a Christian recording artist after having experienced the depths of brokenness and depression. It was her own brokenness that infused her music with such beauty and compassion. Steady My Gaze, slated for release this fall from Shadowlands Music, will be her seventh album since 2003. She has been honored four times as the Best Female Praise and Worship Artist USA by the UK Christian Music Alliance. Watson can be heard worldwide on UCB Radio Ireland where she hosts a daily inspirational radio show, and when she is not on the road she plays violin in the Kalamazoo (Michigan) Symphony. Watson has appeared on The 700 Club, TBN's Praise The Lord, Cornerstone Television Network's flagship show, Real Life, LeSea TV's The Harvest Show, CTN's Bridges and many more media outlets across the globe. Watson is married to Mark Roberts, a chaplain in the United States Air Force. She lives in Lawton, Mich., and has four children: Charlie, Andrew, Grace, Katharine, daughter-in-law Emily, and grandson Chase. 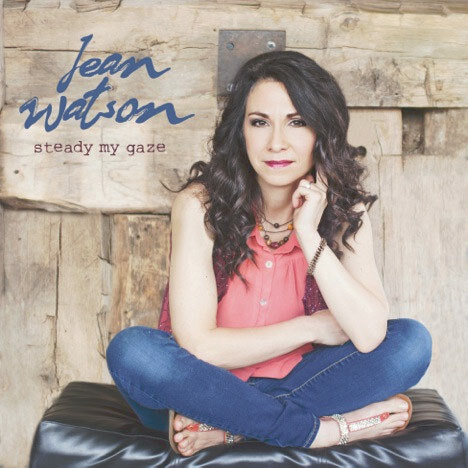 For more information on Watson and Steady My Gaze, visit jeanwatson.com or like on Facebook at Facebook.com/JeanWatsonMusic.